Shaman’s High from De Sjamaan is a cannabis strain that can be described as one of the more heavier strains. This strain is originated by crossing the two most famous and popular strains in the world, namely the Northern Light x White Widow. 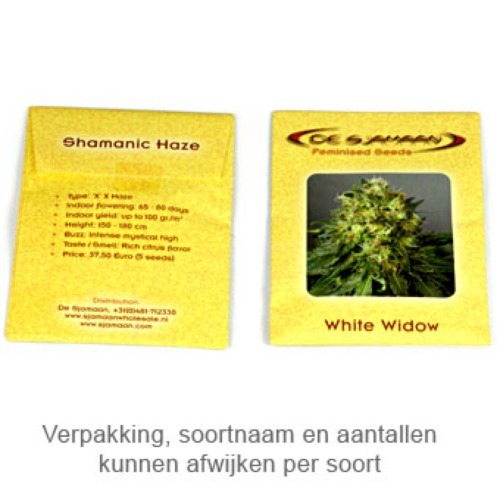 De Sjamaan Shaman’s High are cannabis seeds that are mainly suitable for an indoor grow. These seeds will grow to plants that contain the characteristics of an Indica strain. The buds of this plant will be full of THC. This cannabis strain is not suitable for smokers with less experience because the effect of smoking this weed is a very heavy stoned feeling. This strain is only recommended to the experienced smoker. Tell us and our customers what you think of the Shaman's High from De Sjamaan.